Adam Gordon is a young American on what is basically a "gap year" in Madrid, a scholarship paid for by a foundation to support his research into the Spanish Civil War through poetry. A young, promising poet, with middle class parents, Adam is also self medicating along with a succession of white and yellow pills for his unspecified condition (he mentions at one point that he is bipolar.) In the first person narrative he begins with a regular routine, where his "project" is to see if he can actually feel any sort of "experience". He goes to the gallery, a short walk from his small loft room in the centre of Madrid, and looks at the same painting each day, having dosed up on pills and strong hash before hand. Ben Lerner's debut novel, published in 2011, is part of a rich tradition of coming of age novels featuring young writers experiencing life for the first time. This novel almost seems a literary rites of passage for American writers - think "Less Than Zero", "Bright Lights, Big City" - but has its precedence primarily with Hemingway and "The Sun Also Rises." Yet taking place in 2004, this is yet another post-9/11 novel. David Foster Wallace's contention that our future novelists will get their experience from television rather than from real life is borne out here; yet 9/11 provided that unique thing for America - an incident that happened to them, without travelling to find it. Yet so televisual was 9/11 that most people did experience it on the screen. Replace "television" with "internet" and we have the contemporary experience as something that happens away from us, that our ennui is not caused by events as such, but our lack of events. So Adam self medicates. He avoids having a mobile phone (odd surely even in 2004) and wary of becoming the sort of American who never acclimatises, avoids the company of his fellow foundation fellows. He lives a bored, lonely life which eventually turns into something more real through meeting Arturo, a gallery owner, and a curator, Teresa, at a bar. He becomes part of this alternate Spanish set. They really are the beautiful people - rich, workless, or so it seems, political, as only Europeans can be, apparently promiscuous. Latching onto this life, his status as an acclaimed young poet only makes his own doubts even more vivid. For Adam thinks he is a fake - that everything about his poetry is fake - he knows what he writes in his notebooks is made up, juxtaposed randomly. He is lying about his research. He is lying about everything eventually, using his decision to mostly speak Spanish, as a reason for his reticence. Bit by bit his unawareness that he is changing, that experience is what you do, not what you think about, comes out as his real "coming of age." In the meantime there are lots of drugs - but without any danger, it is easy to pick up hash from the dealers in the square, it is even easier to get through the massive stash of medications he takes for anxiety, sleeplessness, his mental state. The ennui is, anyhow, something that he pre-empts. He knows how solipsistic he sounds, how meaningless his life appears, how in even trying to apply meaning he is a dilettante. So much of what one expects from the unreliable narrator. There is something of the Jamesian hero abroad here - a man on whom people project so much, but which he gives little evidence of anything being there. Yet his personal insecurities, that manifest themselves in killing off and demonising of his absent parents, don't stop him being more than capable when he gives a reading or when he's asked to show his poetry. The reticence is seen as a sign of his seriousness. Yet there's a sense where Adam is a fake, and his knowing that he is a fake is what is so key. Here he is, a funded rich kid slumming it in Europe for a year - the Grand Tour - and even if he avoids other Americans he begins to recognise a "type" like him, who appears Spanish, speak Spanish, hangs out only with the Spanish, but look closely, and you see they are deliberately separating themselves from the cliche of the American tourist in this subterfuge. If there's a protesting too much about this its because of how much more polyglot European cities seem these days; particularly in artistic, cultural and academic circles. The only poor people noticed in the novel are the African dealers, and after the Madrid bombing in 2004, they disappear, apparently rounded up by the previously tolerant police. For yes, real life does come into this "gap year". Being so concerned about his lack of authenticity, Adam finds himself in the vicinity of "History." Yet the modern hero can do no more than queue to give blood, the rest of the time, joining the rest of the world on television watching what's happening a few hundred metres away. There's a more subtle question at play here, which is deftly handled, for the American becomes not just a bystander or a visitor but a representative of a culture - a culture where experimental poetry can do nothing, has no part. Anger over the right wing Spanish government's support of America is directly linked to Madrid being a target. Yet the problem with this "action" taking place in a novel that, like Houllebecq's existential debut "Whatever" is so otherwise inert, is that of course it is an appropriation. For Adam represents nobody other than himself. If anything he is escaping Bush's America, watching CNN for daily reports on deaths in Iraq. The novel is so through a solipsistic young American poet's eyes that the picture soon fades, and empathy is removed. The Spanish film "La Soledad" did a far better job of being obliquely there at the tragedy; but like McEwan's "Saturday" this is a novel where the characters are bystanders to history, untouched by it. In many ways, how you to take to this short, fascinating, elegant novel will depend on how much you can take Adam/Lerner's self obsessive self awareness. There's a framework of sorts which helps - with "Leaving the Atocha Station" referring both to the Madrid railway and the Ashbery poem. In between learning Spanish and trying to get involved with two different women, Adam finds himself pondering art, and aesthetics. If nothing is real - if no experience is real - then how can the approximation of experience that great art promises be anything other than fake? He discusses Ashbery's line construction as one way out of the conundrum. It is a case, that the work of art refuses paraphrase, that it can be experienced but not explained. Sitting on a panel being asked about "Literature now" he wonders whether such a thing is impossible to discuss. He says he will never write a novel. Lerner, a poet as well, is nothing if not an accomplished trickster. He knows what he is doing, even as Adam doesn't. 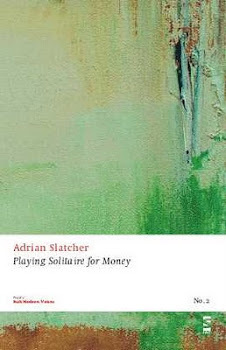 I can hardly imagine a British debut novel being allowed to get away with the intellectual ennui, softcore privilege and consideration of itself, in the way that "Leaving the Atocha Station" does, yet this highly inward tale is a genuine pleasure; ideally read at a single sitting, where some of the more self-centred passages can be offset with the genuine quality of his writing. For Lerner writes long paragraphs that build up sub clauses on sub clauses, to create a similar hypnotic whirl to the self medicating head of the narrator. Madrid, and Spain (he visits Granada, fails to visit the Alhambra, visits Barcelona, and immediately gets lost and spends the rest of the day trying to find his hotel), are present, but hardly present at all in a sense, as the sensibility is that of the outsider. Yet America has gone as well. We know the narrator is speaking Spanish, so the writer gives us very few Spanish words. Its a deft act, which sees a self obsession, a self awareness that only occasionally becomes self immolation. As ever in these books, the narrator is puzzled by why the women won't make love to him (though one does, one doesn't - though she kisses him and sleeps with him) but at the same time makes no effort to tell them anything of truth. Like the elderly Strether in James' "The Ambassadors" the Europeans seem to appreciate the charms of the naive, unknowing American puritan, without the reader ever being that convinced by him. There are a couple of missteps. The messaging with a friend in Chile who tells him a story of his "gap year" travel which Adam then appropriates as his own, seems a little too forced; whilst a scene where he expensively raids his parents' credit cards merely, it seems, to give his first girlfriend an awkward "farewell", seems to jar with the image we have of Adam as being a lovable fool; here he seems manipulative and callous. Yet, despite this, I couldn't help but think its the best thing I've read for a while. There's originality here, albeit through a prism of McInerney, Houllebecq, and (especially) Ben Marcus, and similar material in Bolano's "The Savage Detectives" is so much more real. Like in Luke Kennard's poetry, Lerner has already pretty much admitted to or noticed the contradictions and failings of the privileged, self-aware but inert life of his protagonist, and holds his hands up half in satire, but half as if to say "what else can I do?" With a 2nd, apparently equally solipsistic novel recently published, 10:04, I guess there may well be a sell-by date on this kind of insularity, but you don't have to particularly like the flawed central character of "Leaving the Atocha Station", to find it one of the more interesting debuts of recent years. Earlier this year I was invited to contribute to the Prague-based magazine VLAK, whose 5th issue can be ordered now. Available in May, it looks like it will be a beautiful publication, and I can proudly say that I'm published alongside such luminaries as Marina Abramovich, Alan Halsey, Charles Bernstein, Clark Coolidge, Allen Fisher and many others. It includes my new story "The Good Citizen." There will be a Prague and London launch coming up in May, more information nearer the time. This is my 2nd publication of the year, as my long poem "Parallels" appears in the new issue of Prole. A state of the nation poem, I'm particularly pleased that I've managed to get it into print in the weeks before the new election. Nearer to home, I'll be going to "Poets and Players" tomorrow. Centre for New Writing's John McAuliffe, Next Generation Poet Melissa Lee Houghton and Maria Isakova Bennett are reading alongside students from Chethams. Highly recommended. Then on Monday, the ever excellent Verbose night comes round for a 4th time. This time its a special launch event for the 3rd issue of the evolving Confingo Magazine, which, if you remember, I was featured in the 2nd issue. 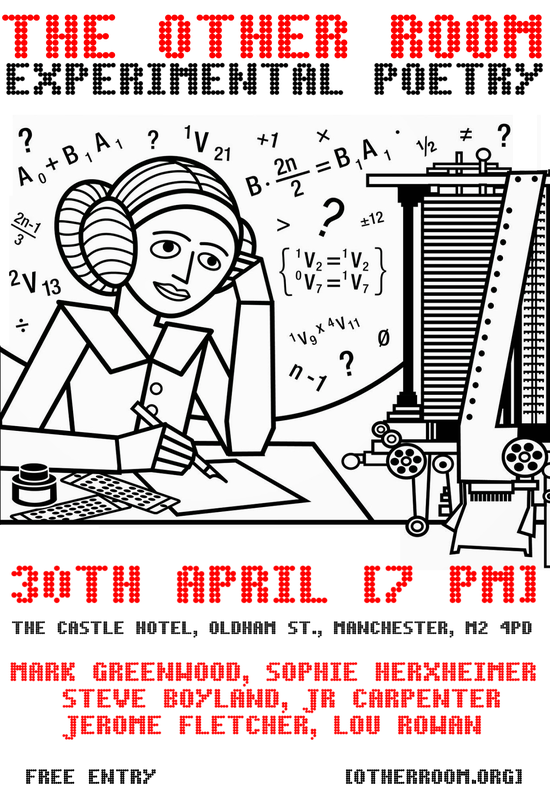 Also next week is the next Other Room, at the Castle Hotel on Oldham Street on Thursday. The Cornerhouse closed its doors for the last time yesterday (excluding a ticket-only event this weekend). So farewell a constant presence in the thirty years I've been visiting or living here. When all these Joy Division documentaries go on about grim Manchester, or city leaders talk about the renaissance after the bomb in 1996, it doesn't equate to my memories of the city, and a big part of that is the Cornerhouse. Coming from a small village, visits to Birmingham were exciting as a teenager, though I can't say I did much art, just mainly music and shopping. When I went to university at 18, the small town of Lancaster was a great place to be, but lacked the big city attractions, so regularly we'd get on the train or share a car to Manchester. "Blue Velvet" the film that was the audience-choice closer last night, was one I watched at the University film club, I think, so it was probably "Sammy and Rosie Got Laid", a raw, northern British comedy which was the first movie I saw at the Cornerhouse. I've seen quite a few films there over the years, though less so of late, though that's as much my changing habits as anything else. For some people the Cornerhouse was always primarily a cinema, but I remember going to see the BT Contemporaries there in the 1990s with Damian Hirst's "pickled shark" on display, so I've been a regular visitor to its art over the years, though the quirky three gallery space has always been a difficult space for an exhibition to truly own, particularly as more multi media art became fashionable in the new century. Then there's the bar - most people I've spoken to have forgot what the bar used to be like before the makeover in - when was it? - 2002? I used to like that old bar, it was a bit of a quiet hideaway on a Saturday night if you were meeting someone for a quiet drink. I was a regular for a year or so at a Monday night quiz where I went with members of a few bands I knew. Through work, since 2005 or so, I've got to know the Cornerhouse staff, and Dave Moutrey, its longstanding manager, and have used the extended spaces of the extension for plenty of digital events. Though the one time I actually "performed" there was before then - when I was asked to be part of a film/poetry night organised as part of the Manchester Poetry Festival (as it was then). Three films were shown, and the poets associated with each did a short reading. It was probably my first poetry reading, come to think of it. When we started a little magazine, "Lamport Court", over half of our sales came from the Cornerhouse bookshop, and its worth noting that despite the film and the art, that the Cornerhouse has for a long time been the unofficial headquarters of the Manchester literary scene, a place where writers could easily sit on there own, with a coffee, writing the next thing. I imagine its had a cameo part in quite a few books and stories over the years. In the inevitable business plan for the exciting new multi-arts venue down the road, that its moving to, Home, I do hope that literature isn't forgotten, just because it doesn/t require the same kind of institutional investment as theatre, art or cinema. The new place will raise the bar for a multi-arts venue, extra cinema space allowing more varied programming, two theatres rather than Library theatre's one, including a flexible studio space, and a new purpose built gallery space. I suspect that the artistic things I loved about the Cornerhouse - collaboration, festivals, serendipity - will all be enhanced at Home, which has the opportunity to be much more than "just" a programmed venue. What will be lost, of course, is the brilliant location, just beside Oxford Road Station, on Oxford Road, so almost always encouraging me to pass by or drop in, just for a coffee or a browse in the bookshop or in the hope of bumping into someone. The thing is, such serendipity is less about buildings or investment and more about people; so I'm not so hung up on the change - the world moves on. Coming from South Manchester on the tram, the new site is nearer to Deansgate-Castlefield than the old one was to St. Peter's Square, so I'm thinking I'll be popping by nearly as regularly. Inevitably, the last few nights the bar and restaurant was packed, a sign of how many personal memories are wrapped up in the place. The Manchester I came to in the mid-80s had its ramshackle elements, but the Cornerhouse was a symbol of its modernity, at a time when film was going through a periodic renaissance, and there was a wide enough audience hungry for an emerging popular avant garde. I'm not sure if its ever shown any superhero or Tolkein movies - I hope not - but I'm sure it showed comic book adaptions such as "Ghost World" and "American Splendor". In many ways the art cinema defined taste for my generation - dark American independent movies such as "Blue Velvet" alongside startling European films by directors like Aldovomar. Manchester has never had a major film festival (though Cornerhouse's Viva - Spanish and Latin American film is a regular niche highlight) but in many ways, my memories are that the Cornerhouse programme was always a film festival, just as the art and music scene in the city may be enhanced by Manchester International Festival, but aren't replaced by it. They had a giant pencil unstallation in Cornerhouse the last few weeks for people to put down their memories, and if I didn't partake it was partly through an uncertainty about nostalgia, but mostly because my memory of the place is so wide, so fragmented, covers so many different aspects of my life over the last thirty years. The news is that the building will be used by MMU for the next three years, before inevitable plans are made around the refurbishment of Oxford Road Station, and its not clear whether there will be any public aspect to that. Its sad that both the name and the building will disappear into memory, cultural institutions are grown not built, after all, but it is a different world now - with digital film projection, an internationalised art scene, and technology taking its place in theatre as well as other spheres. Goodbye, Cornerhouse, its been lovely having you around. One thing I think I miss from not having much of a religious upbringing, is the full psychodrama of Easter. This is after all the really exciting bit of the New Testament, and the Christian church has done its best to create a compelling narrative of ritual to match the story of the Passion. It also inspires quite a lot of fascinating art, from Caravaggio's portrait of Jesus in Gethsemane, through Bach's St. John's Passion, to Mel Gibson's bloody but compelling The Passion of Christ. Passion is a fascinating word, and the archaism of the Biblical "passion" has always fascinated me. What is so passionate about this violent death? There seems a category error somehow. Then there's the Stations of the Cross, the resurrection, the ascension; and the rituals of the church alongside it. Anyway, that's someone else's paraphernalia I think - we have an Easter holiday of our own - four days that can sometimes seem the dullest weekend of the year. Friends with families buzz off, desperate in the grey late winter/early spring to find some sunshine. We're tired by this time of the year. Working in the public sector, 1st April is also our first day of a new holiday year - accounts are finished off and passed over into the new financial year. April Fool's Day gives us a bit of light relief - on the one hand I thought the internet would ruin the jokes, but weirdly, since everyday on the internet can sometimes seems like a Fool's day, it doesn't seem to have. Marketing and P.R. departments let their hair down for once and are able to say "it was a joke" without much likelihood of condemnation. It's a strange one this year - as I've got to April without quite thinking my way into 2015. Its been a busy year already, though partly through persistent colds and sicknesses, and with a couple of exceptions, a grey, grim weather. I'm a year older, and feel at this time of year, a little wearier. Yet if I take stock, its more because the year doesn't seem to have quite started yet. Things will change: have changed. Its been a great year for artistic friends and acquaintances of mine. Lonelady's 2nd album "Hinterland" has come out to rave reviews and a #72 chart placing; a gem of a record from one of my oldest friends. Other people who have been working in the shadows seem to be stepping out - and yet I know how much graft goes into this. Paul Harfleet's "The Pansy Project" was featured in the Guardian; Jackie O'Hagan's autobiographical show "Some People have too Many Legs" is touring the country and even saw her being filmed for the One Show. Sarah Butler's second novel, "Before the Fire" has just been published, and later in the year will see new books from Elizabeth Baines, Neil Campbell and David Rose amongst others. I've always been surrounded by quite a bit of talent, its good to see that perseverance pays off. It is this more than the big artistic statements that matters of course: but one would be churlish to not be excited by Home, the new art centre which will combine Manchester's Library Theatre and Cornerhouse, which this week closes it Oxford Road doors for the last time. So many memories - I think I would have gone there the first time I came to Manchester in late 1985 - alot of my life is there, yet I've been reluctant to join the memorialising; as the future is surely more exciting. New stories to be lived and written. It's a Manchester International Festival year as well - so I need to pay attention in the early summer. So, I'm sat here in the middle of a 2-day working week, and carrying on in my own inimitable smalltime way, and thinking, that we do all right, though the psychodrama of a Tory government, which the coalition has been for the last five years, never seems to do anything for me, my life, or that of my friends and family. The thought of another five years of right wing managerialism, incompetence and indifference doesn't fill me with glee. A poem never changes anything of course, though I've written one, which will be out soon enough. On the other hand as an election junky I do find there's a palpable excitement about an election as unpredictable as this one. I would like another 1997 moment, at least once in my life - I suspect I won't get one this time, but you never know.